Whether you know it or not, every day you chomp down on carbohydrates. But, what exactly are carbohydrates anyway? Carbohydrates or "carbs" are a group of nutrients that supply the body with energy. While protein such as meat, eggs, fish, chicken and legumes all assist with growth and structural components such as skin, hair and nails, carbohydrates are the body's main source of energy. Whether this energy is for sport or gym, or just day-to-day living and brain functioning, carbohydrate consumption is vital. Carbohydrates are made up of three components; carbon, hydrogen and oxygen, and come mostly from plant sources, with the exception of lactose, which comes from milk. Plant sources include all types of fruit and vegetables as well as starches and grains such as rice, potatoes and pasta. When we eat carbohydrates, our body receives the energy contained within them, and if you were absent in science class, here is a crash course on how it works. Plants absorb energy from the sun in order to grow and blossom, they then store this energy in their roots and flowers and when we eat those roots and flowers; that energy gets released into our system. It is important to note, that not all carbohydrates are equal. There are two main classifications of carbs, rated according to how they are broken down in the body. These are simple and complex. Simple carbs include glucose, sucrose, fructose and lactose and these provide the quickest energy supply as they are broken down the fastest, releasing the quickest burst of energy into the blood stream. Complex carbs, on the other hand, provide a slower, steadier release of energy into the system and these include foods such as fiber and starch as well as grains such as bread, pasta, potatoes, corn and other vegetables. Carbohydrates are made up of glucose chains. Depending on the type of carbohydrate you eat, small or large dosages of glucose will be released into the system. All carbohydrates are converted into glucose in the body, glucose being the main source of energy. Simple carbs have the quickest release of glucose, therefore the quickest supply of energy, whilst complex carbs convert to glucose at a slower pace, releasing energy slowly into the system. Carbs are essential in day-to-day functioning not only because they are the body's primary supply of energy, but because they are the brain and central nervous systems' only source of energy. It has been noted that the human brain and central nervous system require about ten tablespoons of glucose per day. Single unit carbohydrate. This is the form in which all carbs are broken down into within the body. These include cane sugar, brown sugar, honey, beet and maple syrup. These include fruits and certain vegetables as well as high-fructose corn syrup and honey. These include milk and other dairy products. These include sugar, beets and fruit. 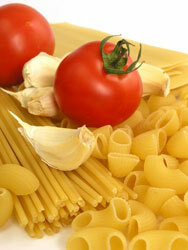 These include fiber, starch, bread, pasta, potatoes, corn and other vegetables.